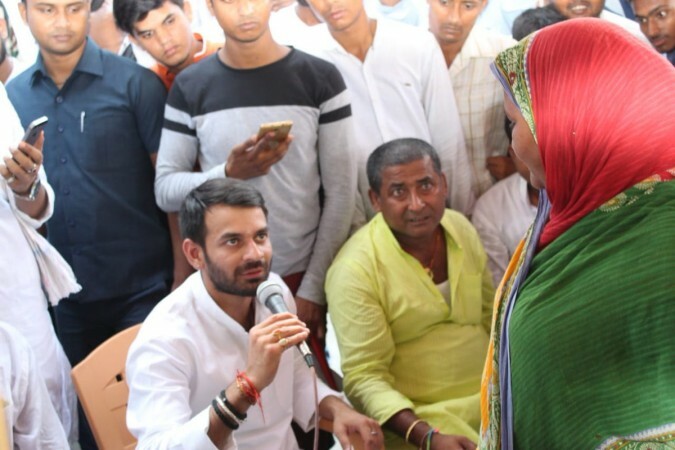 Former Bihar CM Lalu Prasad Yadav's eldest son Tej Pratap Yadav was highlighting the rising fuel prices and the health benefits that come along with cycle riding. Bihar Deputy Chief Minister Sushil Kumar Modi took a dig at Rashtriya Janata Dal (RJD) leader Tej Pratap Yadav for riding a cycle rickshaw at Mahua in Bihar's Vaishali district. The picture showing Lalu Prasad Yadav's eldest son riding a cycle rickshaw drew flak from the Bharatiya Janata Party after Sushil Kumar Modi alleged that Tej Pratap was "cheating the poor." Tej Pratap was highlighting the rising fuel prices and the health benefits that come along with riding at own assembly constituency. "Everybody should drive a rickshaw. It would come in handy at a time when fuel prices are soaring. The physical exertion involved would also bring health benefits," Tej Pratap was quoted as saying by Press Trust of India. Tej Pratap had also attracted the crowd by hosting an event called "Sattu with Tej Pratap." He even took to the streets to bath under a roadside hand pump. When he was asked about his actions, the RJD leader said: "Mahua is my home and I have no reason to feel shame." "Those owning a Harley Davidson bike worth Rs. 20 lakh and a BMW car worth Rs. 40 lakh, get themselves photographed while driving a rickshaw. They want to keep up their family business of cheating the poor people," reports PTI. Not just the BJP but even Janata Dal (United) joined in on the bandwagon and condemned Tej Pratap. "The people of Bihar have had enough of the antics of Lalu Prasad. They do not have the patience to put up with the farce of his son. If Tej Pratap Yadav has any sense of honour, he should not continue to own his costly car and motorcycle but donate these. After all, it is unlikely that he had bought these with his own earnings," JDU spokesman Neeraj Kumar was quoted by PTI.